In consequential LCA modelling, long-term market trends and constraints play key roles for the identification of the long-term marginal suppliers of each product, that is, the suppliers that will change their production capacity in response to an accumulated change in demand for the product. When there exists only one supplier of a specific product, or when a specific group of enterprises are so closely linked in a supply chain that there is in practice no alternative suppliers, these specific suppliers will also be the ones that will change their production capacity in response to changes in the demand of the specific customers. As a default, however, when there is no information available to justify that a specific supplier (or group of suppliers) will be affected, it is advisable to assume that a market is involved, in which case closer scrutiny is required. Within a given market, not all potential suppliers/technologies will actually be affected by a change in demand. For short-term changes the immediately affected suppliers will typically be the least competitive (often using older technology), since these suppliers are most sensitive to price changes and will typically have capacity available. In an LCA we normally study a long-term change in response to an accumulated change in demand. Which suppliers are affected in such cases will depend on the overall market trend. In a market that decreases (at a higher pace than what can be covered by the decrease from regular, planned phasing out of capital equipment) the affected suppliers that are forced out of the market will typically be the least competitive. If the market is generally increasing (or decreasing at a rate less than the average replacement rate for the capital equipment), new capacity must be installed, typically involving a modern, competitive technology. Therefore, it is important to identify the market trend (“Is the market increasing or decreasing?”) especially for long-term changes involving capacity adjustments. It follows from the above distinction, that if the general market volume is decreasing at about the average replacement rate for the capital equipment, the effect of a change may shift back and forth between suppliers with very different technologies, which makes it necessary to make two separate scenarios. This may be relevant for a fairly large interval of trends in market volume, since the replacement rate for capital equipment is a relatively flexible parameter (planned decommissioning may be postponed for some time, e.g. by increasing maintenance). In general, the replacement rate for production equipment is determined as the inverse of the estimated lifetime of the equipment. As a default, when information on market trends is not available, an increasing market may be assumed, since this is – in spite of obvious exceptions – the general situation for most products, due to the general increase in population and wealth. There can be other reasons than market trends and competitiveness that causes a potential supplier to be constrained, i.e. not being able to react to a consumer demand, notably shortages in supply of raw materials or other production factors (resource constraints), and market failures, regulations or quota systems (political constraints). 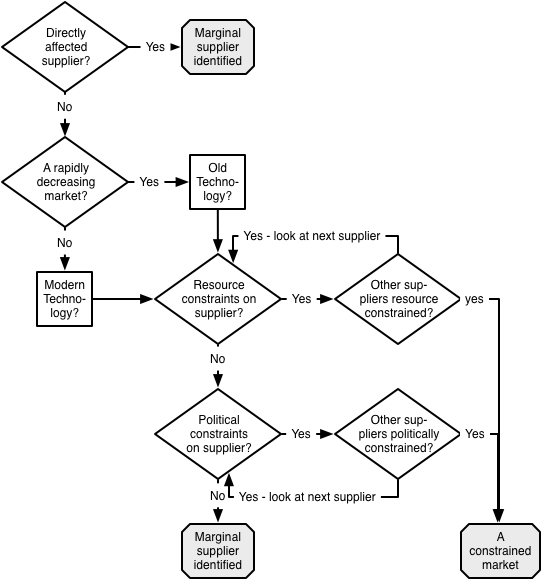 Figure: Decision tree attempting to explain the iterative way of working over your different suppliers to identify the marginal supplier. When there is no market Identifying situations where a specific group of enterprises are so closely linked in a supply chain that the production volumes of the specific suppliers can be shown to fluctuate with the demand of the specific customers. A rapidly decreasing market Identifying the least competitive technology in a rapidly decreasing market. Increasing or slowly decreasing market Identifying the modern, competitive technology that will be affected by a change in demand for a product that has an increasing market. Resource constraints on suppliers Identifying suppliers that are constrained by the availability of resources. Political constraints Identifying quotas, taxes or subsidies that provide constraints on the ability of specific suppliers or technologies to change their capacity in response to changes in demand. Constrained markets Identifying products with constrained markets and the marginal consumers that are affected by changes in demand on these markets. The special case of electricity Electricity consumption is an important part of most LCAs and modelling marginal electricity in life cycle inventory has given rise to many debates during the last decades. How to cite this: Consequential-LCA (2015). Marginal Suppliers. Last updated: 2015-06-18. www.consequential-lca.org.